A Reluctant Foodie: Getting in a Stew! Hello again, I'm back here again on A Reluctant Foodie! Al and I decided to go head to head for a third time with a new blog challenge as we have enjoyed our previous battles so much (Stuffed Peppers and Meatballs). This time round we settled on the theme of 'Soups of Stews' which seemed utterly perfect for this time of year and the kind of food you feel like eating over the Winter months.In fact, I eat soup numerous times a week and I am always pulling out the slow cooker at the weekends to knock up some kind of stew. When it's cold outside, I crave bowls of hot nourishing food that comfort and sooth the soul. So I was more than happy to ponder and devise such a restorative dish for this challenge. After much consideration I settled on a Seafood Stew with the main ingredient being a rather divisive one so I hope I don't scare you off! I have chosen to use squid, not everyone's favorite ingredient but certainly one of mine. So much so that if I see squid on a restaurant menu nine times out of ten I will opt for it. I love the taste and texture when it's cooked right. The key is to cook it very quickly or very slowly. Anything in between can result in rather unappetizing rubberiness, but get it right, and it's a true delight. I think that for most people, seafood stews are more affiliated with Summer. They are of course lighter than their meatier counterparts and are often bursting with Mediterranean flavors. So my challenge was to produce something that befitted Winter and the innate need for heartier substance that it breeds. So, as well as squid, I have included chunks of chorizo sausage which adds an intense heat to the stew and also king prawns. All cooked leisurely with tomatoes and red wine in a rich, powerful seafood stew that most certainly has the power to banish your Winter blues and bolster your body against the elements. 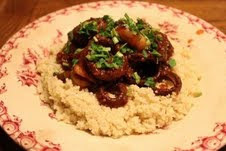 The squid is soft and stained red by the wine, the chorizo provides a kick of heat and the prawns pop juicily in your mouth.The resulting stew is truly delicious and memorable. If you are anti-squid, this could be the dish that changes your mind. Honestly, I cannot imagine anyone who wouldn't like this wonderfully flavorsome dish. This was most definitely worth getting in a stew over! In a large pan, heat the olive oil. 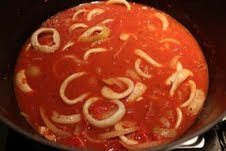 Add your squid rings and cook for a couple of minutes. 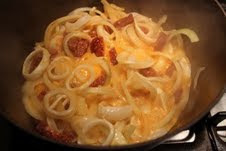 Add the onion, chorizo, garlic and thyme and cook for 5 minutes until it hall softened and some of the red oils have seeped out of the chorizo and stained the other ingredients beautifully. Stir in the tomatoes, red wine and 250 ml of the water. Bring to boil, cook and for 2 hours. Check occasionally and give it a stir. Add extra water periodically of you think that the sauce is becoming too dry and thick. 10 minutes before the two hours of cooking are up, add your king prawns to the stew and stir them in. Squeeze in some lemon juice and let it cook for the last few minutes until your prawns are cooked through.Check the seasoning. 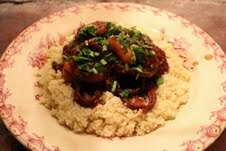 Serve with some couscous and sprinkle over some parsley. Heavenly. I am a Private Chef living in South West France. I am a 36 year old mother of two, living the rural dream. 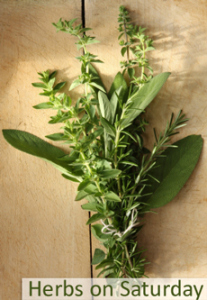 I love to cook all food and am inspired by fresh produce and the cuisine here in France. From rustic traditional dishes to vegetarian fine dining, I try to cook it all and share my journey with you. Stop by and check it out here! I can imagine this is tasty stuff! Hi Milli - thank you very much. I can 100% guarantee you this stew is full of flavour and really packs a tasty punch! I absolutely love the time you allow for the sauce to build. Your meal would be good with or without the squid depending on the guest. You are quite right Roger, it would work fine minus the squid. You could uuse chunks of white fish instead but obviously you would need to cook it for much less time. Mussels would also work. And ever Octopus I think!